Turbulent forces create a visible vortex, increasing the amount of oxygen in your drinking water – up to 30% in 20 seconds. The lack of sufficient oxygen can be a significant contributor to disease and ill health. One way to increase the amount of oxygen available to our tissues is to drink oxygen-rich water. The Vitalizer Plus creates a vortex of spinning water incorporating oxygen just like what happens in Nature. In fact, Hexagonal Water holds more oxygen than unstructured water. Dissolved oxygen testing shows that the Vitalizer Plus adds significant amount of oxygen – even to already good quality bottled water. Using Yosemite Crystal Water, dissolved oxygen levels were tested before and after Vitalizing. 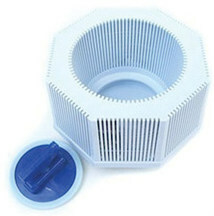 A mineral cube within the unit, releases structure-making minerals during the vitalizing process to help structure the water and increase alkalinity. All mineral balls have passed heavy metal and anti-bacteria tests. Living water contains ionic minerals – incorporated naturally as water rushes over rocks and mineral formations. In order for the minerals to be absorbed and utilized at the cellular level, they must be in an ionic state – not suspended as in many colloidal. Vitalizer Plus contains a mineral core that contains a balance of ionic minerals which are released slowly as the water swirls. The alkalinity is NOT produced by electroporation. The alkalinity ball is placed together with other mineral balls. The minerals are gradually released through the magnetic and vortex power. Did you know that most filtered, bottled, distilled – even reverse osmosis water, are acidic? Depending on the initial pH of the water, the Vitalizer Plus can bring the pH up as high as 8.5. The resulting energy in Vitalized water is enough to begin to balance the organs of your body – within minutes after drinking. Kirlian Photography is a process that uses high frequencies and electron streams to take pictures of the invisible radiating energy fields that surrounds all living things. Through a Kirlian camera, we photographed the energy radiating from the fingertip of a healthy individual before and after drinking 8 ounces of Vitalizer Plus water.